“The Chief”, aka Geronimo Berroa finished his MLB career in 2001 with a total of 101 home runs. The journeyman slugger spent time with nine teams in eleven seasons. His four best years came with the Oakland Athletics for whom Berroa hit 87 home runs. 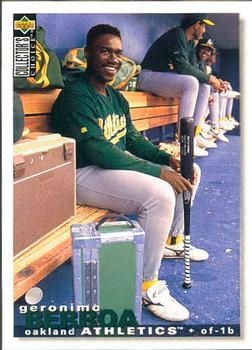 During this time with the A’s Geronimo slugged .499 including a relative pedestrian .451 SLG in 1995. Berroa finished ’95 with twenty-two bombs. Perhaps nothing interesting here except for the fact that Berroa hit 27% of his long balls against one team. In only 13 games against the New York Yankees Berroa slugged six home runs plus three doubles and two triples. In 47 at bats he slugged .894 against the Yanks, .894! In addition to the power surge, Geronimo Berroa was walked in 17% of his plate appearances against New York in 1995. So who gave up all these home runs to “The Chief”? 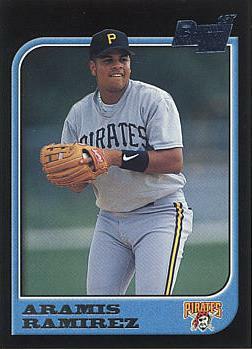 He hit two off Scott Kamieniecki and one each off four other pitchers including rookie starting pitcher Mariano Rivera. The Washington Nationals have hit the third most home-runs among NL teams. Atlanta Braves batters lead the league and have hit 15 more taters than the Nats. There is an interesting twist taking place this year as Davey Johnson‘s team has more HR’s than any other team in the senior circuit when playing away from their home park. Washington’s 87 road HR’s are four more than the Braves have hit away from Atlanta. Not surprisingly home teams tend to hit for a little more power than the visiting clubs. Washington bucks the trend and hits for significantly more power away from Nationals Park. Who is responsible for this deviation? Third baseman Ryan Zimmerman. Besides Zimmerman being on a tear over the last month (9 home-runs in his last 11 games alone) he has also been on fire when he gets away from his home park. This is a new trend for Zimmerman. Coming into 2013 he had hit 77 career HR’s at home and 76 on the road. This year he has hit 19 of his 24 bombs away from home. Finally, you will never guess who leads the NL in home-runs hit away from home. It’s not Pedro Alvarez or Paul Goldschmidt, the only two guys with 30 bombs overall this year in the NL. The Nationals Ryan Zimmerman’s nineteen road taters has been unsurpassed in 2013. Former Texas Rangers first-round pick Justin Smoak is finally producing near his projected ceiling. The question is, how seriously do we take a 30-game stretch? Over his last 124 plate appearances for the Mariners, Smoak has posted a triple slash of .300/.379/.545. Contrast this to his first 141 PA’s of 2013 where Smoak was a .235/.355/.311 hitter. His full season (67 games) 37% OBP leads the team. The team is the Mariners but this is still a solid on-base skill-set. Which is the real Justin Smoak? Based on scouting and perceive skill-set I would go with the power hitting version of Smoak. Brandon Moss has hit 37 home-runs in his most recent full-season (527 AB’s). The ex-Red Sox prospect is playing half his games in the pitcher friendly Oakland Coliseum means that his road HR pace is even higher (42 HRs/550 ABs). Considering in 2011, Moss led the Lehigh Valley IronPigs in homers I’d say the A’s first baseman has taken a monster leap forward. 1978 was Bobby Cox first year as an MLB manager. He had the pleasure of molding a fine young third baseman from Arizona State. Bob Horner was the first overall pick in the 1978 draft and went directly from swinging the aluminum bat in Tempe, Arizona to the maple wood bats of the National League. Fortunately for the 20-year old rookie with no pro-ball experience he got to begin swinging that maple in the launching pad called Atlanta-Fulton County Stadium. In his rookie season Horner hit 19 of his 23 home-runs at home. His home ISO Power was 300 points higher than on the road. The young third baseman made a quick adjustment to road parks in only his second season. In 1979 Horner hit 12 of his 33 HRs on the road and slugged nearly .500 away from home. The slugger would continue to take advantage of Atlanta finishing his career with 65% of his HRs at home but he did even out his overall power production a bit posting a career ISO of .107 higher at home than on the road. 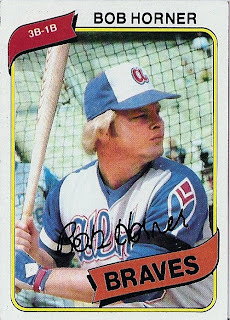 Bob Horner’s most memorable game would come in a loss to the Expos in 1986. In a game in Atlanta where visitor Mitch Webster went 5-for-6 the launching pad would provide Horner with a lifetime of memories. Hitting between Dale Murphy and Ken Griffey, Horner launched 3 homers off Expo Andy McGaffigan and a fourth off star closer Jeff Reardon. Horner became only the 9th player in MLB history to bomb 4 homers in a game and would be the only player to accomplish the feat from 1977-1992. Horner would end up finishing in the top 10 in the NL in HRs in each of his 6 full seasons. If only he could have stayed a little healthier and productive a bit longer he would have a dynamite career. As it is Horner posted an AB/HR rate equal with Jeff Bagwell and Jose Bautista. Pretty impressive for a kid that never played a game in the minors. I will take the strikeouts as they are probably part of a more established trend. The Nats should be freakin’ fun in 2013! Over the last month the Brew Crew from Milwaukee have been scorching hot. Going from twelve games under .500 to five games over in thirty days is quite the feat. So how do you get a team to play .793 baseball while staring a fourth place finish in the face? Hard ASH! During the 29 game stretch they have scored eight or more runs in 10 games and 6+ runs in 14 games. Second year manager Ron Roenicke deserves credit as well for not letting a third place finish get in the way of guys playing for long-term contracts.